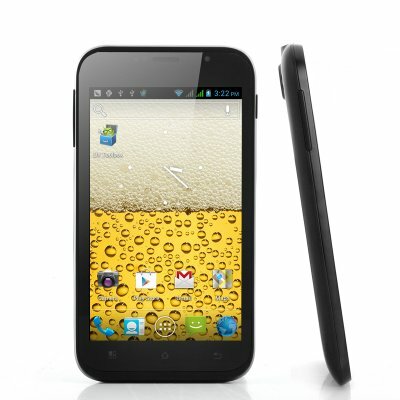 Successfully Added 3G Android Phone "Fizz" - 5.2 Inch 800x480 Capacitive Display, 1GHz CPU, Android 4.0 OS to your Shopping Cart. 3G Android 4.0 Smartphone "Fizz" with an impressively large 5.2 Inch capacitive touch screen and 1GHz CPU as a high quality low price choice for people who want a tablet and phone mix. The "Fizz" gives an amazing bang for your buck with it large 5.2" screen and an impressive MTK6575 Chipset with 1Ghz CPU, yet still is small enough to comfortably fit in your pocket. This android 4.0 smartphone combines the very best features of a tablet PC with its large screen vs the portability and convenience of a mobile phone. The 5.2 inch screen comes with full 5 Point capacitive touch ability and an amazing 800x480 resolution combined with the fast CPU, your gaming, video watching, internet browsing and even productivity will be taken to the next level. The "Fizz" will truly be able to take on any app or program you throw at it, and you will be multitasking like a pro. But it doesn’t stop there! This device comes with 3G as well as wifi for downloading apps from the Android Play Store as well as watching streaming videos, built in GPS to guide you on the road or on foot using Google maps, dual SIM with quadband GSM as well as WCDMA 850/2100 for worldwide usage, a 8MP camera for high quality pictures while on the go, and more. The "Fizz" is a great 5.2 Inch Android Phone and a fantastic find for anyone wanting a high quality android phablet. Available with a 12 month warranty, next day shipping, and a dedicated customer service team, don't wait and order now. Brought to you by Chinavasion, the number 1 wholesale choice for high quality Android Smartphones. Телефон в Украину доставили за 10 дней с дня заказа. Получила мой уже любимый телефончик неделю назад. Счастью нет предела. Работает идеальнл. Очень красивый. Закачала много необходимых мне приложений. Все работают идеально. Использую для работы в интернете. Экран по размеру идеален, больше будет неудобно. Спасибо огромное за качество и красота, а еще больше за цену. a few days ago i received this awesome mobilephone. The 1 GHz MTK6575 is really fast combined with the 512MB of ram. Never expected that this phone for such a low price would run so nice. One Batterie charge keeps the Phone for approximately 3 days alive. Things that are ok on this phone is the Display and the camera. About the display its colours are dependable from the spectator's view. I would say its not a big problem compared to the price you pay. You cant except a IPS screen. In the end i can say that i really love this phone.